There once was a young girl named Elyse. She was an olympic tri-athlete and college student. Suddenly at age 23 she fell ill and became extremely exhausted. Her father had to move to where she lives and take care of her for 1 month. Her strength didn’t return. She became often injured when it seemed others didn’t. She was concerned for her health but didn’t know what to do nor did any doctor. After several years she gave up her athletic career and became a medical sales person. She met many doctors and found out who the best were, but no one could help her. She struggled with terrible fatigue and pain on a daily basis. Over the years she got engaged three times, and all three times her fiancée broke up with her, the last time he told her over the phone. Not even in person! She saw him the next Sunday at church with another girlfriend. This made her very angry, and sad. When she was 28 her mom died in a terrible motorcycle accident. She was heart broken and nothing could make the heaviness go away. She became depressed. One day 12 years after her mom’s death, and 17 years of suffering with her health, a friend of hers gave her a ticket to a 2-day training called The Solution. She had given up hope that anything could ever help her, but the ticket kept staring at her. Finally she looked at the website and read the personal story of the teacher, and it reminded her of herself. So she decided to go to the 1st 1/2 of the 1st day, and if it wasn’t good she would leave. At the end of the 2nd day, she purchased all 9 of the advanced courses offered by this teacher, committing to over 1 year of training. During the 1st weekend of the 2nd training, The Foundation, she volunteered to come on stage and be the demonstration subject for a process that releases old feelings. In 20 minutes the grief of her mother’s death was released from her heart, which was now lighter than it had been in 12 years. Right after this pain left a loud sound came through the speakers. It was the computer running the slideshow presentation. Somehow Skype turned on of it’s own accord. Which is impossible. It’s the only program that makes a sound when it is turned on. Elyse said, “That’s my mom. That’s something she would do.” The audience gasped. And cried. The audience was yet again mystified and excited! They were excited because they were learning how to do this great work for themselves and others and even earn a certification. The Moral of the story is: Never give up hope. Keep believing in your ability to be healthy and happy, no matter what. 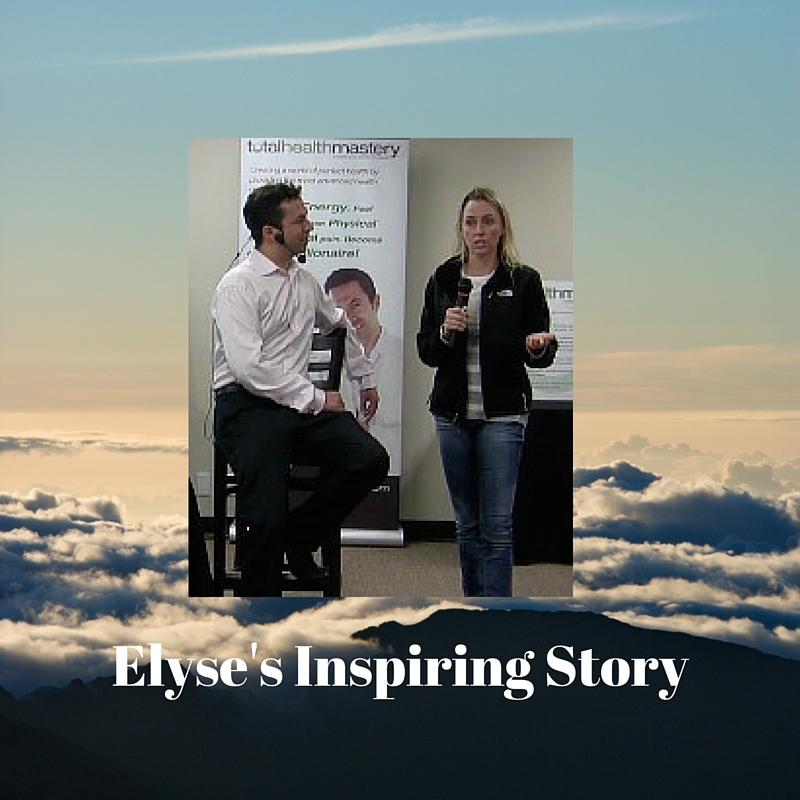 You can see a short clip of Elyse saying “I have felt better in the last year, than I have in the last 10” if you visit Solution Weekend Course page.